This can be taken two different ways and either way will work. You can either go room by room or task by task. The main point is to not try to work on too big of a chunk at a time. Separate out chores by which room they are in and do all the chores for one room before moving on to another room. This way, as you leave the room, it is complete and you can check it off the list. If you would rather do one task until completion, make a list of all of the tasks that need to be done. Then prioritize the list using my tips for completing your to-do list. Also, add focus to the order of steps. You don’t want to vacuum the whole house and then dust as this would cause more of a mess. 2. Use Products that do the Work for you! I’ve found a few great products by watching YouTube videos. Here are some of them! Do you have dirty dishes, piles of laundry, and tons of other chores stacking up? Work efficiently by selectively multitasking. You could be pre-soaking the dishes, while putting in the load of laundry and having another load of dishes running. 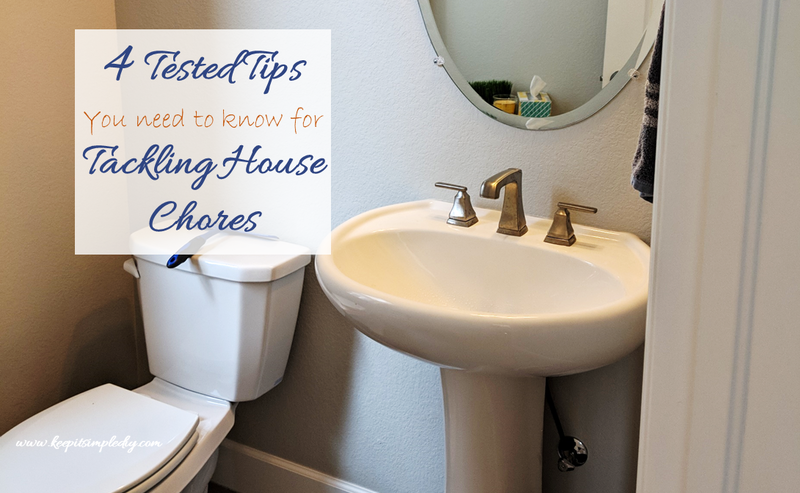 While the laundry and dishes are cleaning, you could work on another house chore. Stack the chores in a way that works best for you and saves you the most time. This one may be a bit late for this time, but for the future, try to clean as much as you can as you go. This will really lighten the amount of cleaning you have to do all at once. Use this tip when cooking, or doing any project. Did you finish the project and leave the hammer sitting out? Put it away when you are done with it so you don’t have a reverse scavenger hunt later trying to figure out where everything goes again.